Open the front door to Knovel’s new offices in Manhattan, and you won’t see rows of cubicles or a maze of hallways. What you will see is one huge room, natural lighting, wide tabletops with staffers working side by side, and floor-to-ceiling whiteboards with notes and formulas scribbled from top to bottom. The space is open, transparent, and functional, a reflection of the strategic philosophy from Ella Balagula. Balagula stepped in to lead at Knovel after Elsevier acquired the technical information reference company for engineers in January 2013. She pivoted her role as senior vice president and general manager of Elsevier’s engineering and technology markets team to work with Chris Forbes, CEO and one of Knovel’s founders, during the first 6 months of the transition. "I can’t tell you it’s been a seamless transition because no integrations are ever seamless," says Balagula. "But I think in terms of blending cultures, it’s been a good thing." She moved, along with her Elsevier staff, to Knovel’s offices, an action that conveyed her intent to build a team and that she was willing to walk the walk. Sure, there were the normal tensions and hiccups along the way in integrating systems between the two companies, but they were all reportedly within the normal M&A fallout. A few staffers also left, but overall, people were incredibly receptive to all the opportunities available to a staff when a large company acquires a smaller one, she says. Two of the advantages of such a merger are giving the newly acquired employees the opportunity to learn new skill sets and providing plenty of room to grow. On the plus side, she says most of the surprises were quite positive, especially how well Knovel is received by customers. "The customers are loyal," says Balagula. When the target was to get 50 customers to become beta testers, 100 signed up. "At SLA, people were giving me their business cards and asking, ‘How can I become a beta tester?’ It showed me just how passionate they are about helping us build this product," she says. Cultivating partnerships is part of the game plan for Year 1. Balagula and her team have already added a dozen new content partners and are on track to add another eight before the end of the year. When McGraw-Hill decided to part ways with Knovel recently, it came as no surprise since the publisher had pulled out of the academic market 2 years ago. But as some partners leave, others come on board. Publishers want to be where their customers are, she says, and once they see channels to new markets, they tend to gravitate to the action. Balagula has a rich background in technology. Before emigrating to the U.S. from Ukraine in 1994, she was schooled as a mathematician and started her career as a computer programmer and analyst, learning to build bridges between IT and the business world. She earned her M.B.A. at the MIT Sloan School of Management and was a management consultant at A.T. Kearney for 7 years before joining Elsevier to manage strategies for the corporate markets in 2007. By 2009, Balagula took over the engineering and technology team at Elsevier to tap growth opportunities in the non-pharma corporate market. "So that was my sandbox," she says. In her strategic role, she sowed seeds for innovation and cultivated the ones that took root. The two big segments that sprouted quickly were engineering and oil and gas. She first met Chris Forbes in 2007 as the engineering market began to blossom. From the get-go, she thought Elsevier should buy Knovel. And 6 years later, Elsevier did. Finding value for the engineering and technology market hinges on delivering favorable outcomes to R&D professionals. The key is in understanding how they work and what native language they speak. A chemist or geoscientist doesn’t think in terms of words, according to Balagula: A chemist thinks in terms of molecules and reactions, and a geoscientist wants to zoom in on a map. "And Knovel is built on the premise that engineers don’t think in terms of words either," she says. "They think in terms of data, material properties, mathematical equations," and that’s where Elsevier strategically fits in. Elsevier customizes the tools and solutions in its product line to meet the needs of a niche target audience, whether that’s Reaxys for chemists, Geofacets for geoscientists, ClinicalKey for clinicians, or Knovel for engineers. "And we will go in and source the content wherever it resides," says Balagula. "We’ll even build proprietary databases, if we need to do so." Then, Elsevier’s development team adds what she calls a "sprinkling of pixie dust" of smart content, taxonomies, and thesauri, and then the team puts that metadata to work. Knovel’s big rollout for Year 1 is an all-new platform, with built-in flexibility, agility, and interoperability. Long-term Knovel executive Diana Bittern, director of product management at Elsevier, led the initiative and worked with Elsevier’s user-centric design team to watch engineers at work, extract their unarticulated needs, and integrate tools and solutions into the workflows. Balagula is exploring ways to integrate Knovel with other engineering software solutions to enhance workflows, so it’s important to see what engineers are doing 3 minutes before going to Knovel and 3 minutes after they leave. The design team then figures out how these processes are connected to build a seamless user experience. The biggest challenge going forward is prioritization, says Balagula. "I want to maintain the culture of innovation and flexibility and allow for the serendipity that happens at the moment of discovery," she says. "Yet, we have to focus on delivering the biggest value to our customers." Balagula sees Knovel giving engineers content that meets three distinct criteria: Answers have to be trusted, discoverable, and actionable. "And those three words are really driving our teams and priorities," she says. Trusted content has to be best-in-class. "If we cannot find it or cannot bring it in for some reason, we will engage with the best minds in the industry to build it for us," she says. Making content discoverable is sometimes a matter of educating information professionals who often think in terms of units of content, whether that’s a book, a chapter, or a page. When a library patron asks about a specific material with certain properties, the answer may be buried in some obscure table in a book. The information professional needs to have the skills to find that specific chart. Finally, content has to be interactive to make the answers actionable, she says. Users have to be able to dabble with data. An engineer may ask how a material will react to changes in temperature or pressure. "For that, you have to be able to download data and experiment with it to model those ‘what-if’ scenarios," she says. Users can put tools to work and apply them to their workflows for the answers. While mobile has become part of our daily lives, Knovel’s new platform is using mobile only for certain use cases. Engineers "are not going to do a complex data search on their phone," says Balagula. "Even if we can make it super easy, complicated mobile searches are not something done on-the-go." For complex tasks, an engineer would rather tackle the problem at her desk with a big screen. But for a student who wants to verify data while he is working on a paper at Starbucks, mobile is ideal. Balagula "wants to find those pockets of use cases where mobile use will be applicable rather than saying, ‘We’ll go mobile for mobile’s sake.’"
Balagula is an advocate of sowing ideas, which she refers to as "seedlings," on whiteboards and cultivating the resulting crop of possibilities. But she wants "to make sure the voice of the customer is constantly heard," and the development team has embedded click-stream analytics into the new platform to ensure that this happens. The team will use these insights to build better products and guide the direction of content development. On the homefront going forward, the focus will be on developing partnerships and adding trusted content across all collections. This year, content for Knovel will increase between 15% and 30%, depending on the collection, and interactive objects, including charts and graphs, will reach a record 125,000, representing a 25% boost. The new platform will pave the way for an innovative and highly agile future. The first release was rolled out to academic customers on Aug. 15 to allow accessibility before the start of the school year; the commercial launch is set for Sept. 9, followed by the upgrade of corporate customers on Oct. 1, and the remaining society customers by year’s end. With Elsevier’s global sales force already well-established, Knovel is looking to expand reach into other overseas markets, with a special eye on Asia. 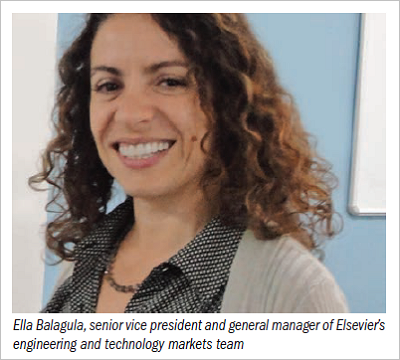 But in order to keeping moving those proverbial mountains, Balagula acknowledges the vital role that the Knovel and Elsevier staff has played from Day 1, calling them the "phenomenal team I rely on." Engineers are everywhere, according to the brief video about engineers on Knovel’s Facebook page. It shows bridges, tunnels, and test tubes, and notes, "Yep, we’re there too." But with the anticipated shortages of experienced engineers in the workforce and the expected increase in demand in the next decade or two, Balagula’s long-term strategy is already taking root. She says the demand for engineers with 5 to 15 years of experience will be the greatest: "I think if you give someone who has 5 years of experience the right tools, it may not give them 15 years of experience, but it is going to make them that much more effective."